1622026063 -ICD-10-PCS 2018: The Complete Official Codebook contains the complete ICD-10-PCS code set and supplementary appendixes required for reporting inpatient procedures. This illustrated codebook presents the code set in 17 sections of tables arranged by general procedure type. Tables within the extensive Medical and Surgical section are additionally sectioned out by body system, indicated by color-coded page borders. ICD-10-PCS contains classifications for procedures, devices and technologies. NEW! Spiralbinding allows for convenient lay-flat use of the book. each body system in the Medical/Surgical section. Complete set of ICD-10-PCS codes. View all 17 sections of tables by general procedure type from medical/surgical to new technology. Official coding guidelines. Learn how to use the code set appropriately following the guidelines specific for each section. procedure performed. Now with body part definitions included in the root operation tables for the Medical/Surgical section. Detailed information on structure and conventions of ICD-10-PCS. 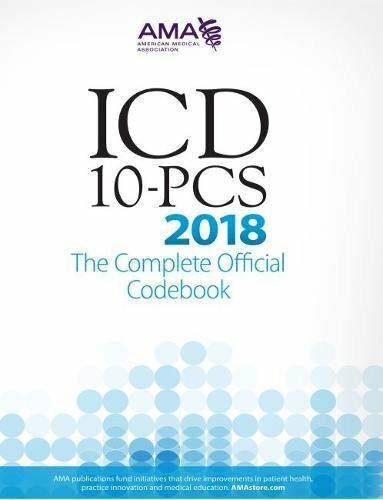 For those new to ICD-10-PCS coding, learn about the unique structure and the specific definitions and functions for each character. Productivity tools. Body part definitions table and root operation conversion table. Procedure combination tables. Identify ICD-10-PCS code combination requirements needed to satisfy certain MS-DRG requirements. Illustrations. Featuring anatomy and terminology included in the ICD-10-PCS classification system.